FREE ONLINE CHAPTERS AVAILABLE here (scroll down for all chapters). NEW TRANSLATIONS AVAILABLE: Arabic (Chapters 3; 4; 8; 10); French (Chapters 2; 10); Pashto (entire book); Spanish (Chapters 2; 3; 4; 5; 10), Tagalog (Chapters 4; 5). To Curb Corruption and Violence, The 'Sandwich Effect' - read the US Institute of Peace blogpost on Burkina Faso, Guatemala and Ukraine - by Shaazka Beyerle and Miranda Rivers. The Romanian People Versus Corruption. The Paradoxical Nexus of Protest and Adaptation - read Tina Olteanu and Shaazka Beyerle's analysis in PARTECIPAZIONE E CONFLITTO, North America, January 10, 2018. Freedom From Corruption self-study curriculum. "This well researched, perceptive book constructs an important international discourse on governance. Democracy has come of age with right-to-information and anticorruption movements in the global south. 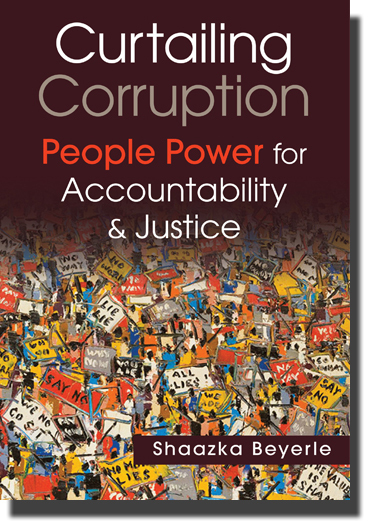 Shaazka Beyerle demonstrates that, in unpacking centers of power, transparency ensures accountability in governance." "A welcome tonic, one guaranteed to give even the most hard-bitten, cynical anticorruption fighter a lift." "A rare work with insights for generations to come. When, as Beyerle writes, ‘citizens join in raising their voices and use their collective power to fight corruption,’ the countries of Africa and indeed most countries will be free."